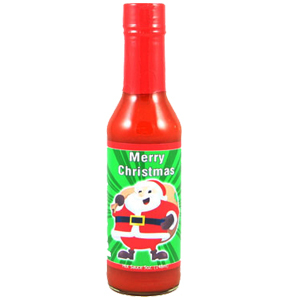 Frosty's Demise Garlic Serrano Hot Sauce is a great Christmas gift! Poor Frosty, he couldn't stand the heat!!! 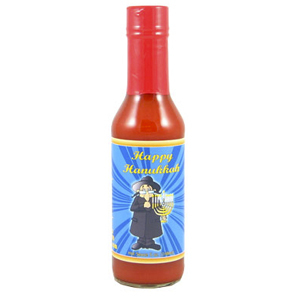 Happy Hanukkah Hot Sauce helps celebrate that special time of the year and add a little spark to light the menora!! Who need three Ho-Ho-Ho's when you can add a HOT!!! This sauce couldn't be made at the North Pole it is so hot.......unless you want to see some real Global Warming!! Our Garlic Habanero flavor is a real treat of heat and garlic and it is perfect to add to marinades, shrimp boils or that weekend sandwich attack!! 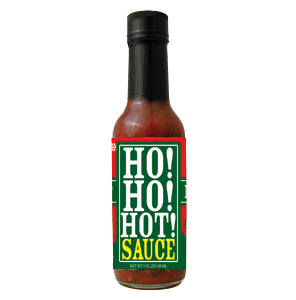 HO-HO-HOT Sauce is great for stockings or just to enjoy during the whole year!! Lump of Coal Hot Sauce is for the naughty little boy or girl, or man or woman. Chances are you thought of immediately who you would give this to, but now you can give someone a Lump of Coal they can actually enjoy!! Awesome gift!! Maker's Mark MINI Gourmet Sauce is a 2 Oz size of Maker's Mark Bourbon sauce and it is perfect for on-the-go flavor or to give to someone as a "little" gift. Made with real Maker's Mark bourbon, this multi-faceted sauce can add a new dimension to your favorite recipe or be used as a dipping sauce or condiment. Try it on steak, burgers, chicken, and anything else hot off the grill. Naughty Police Lineup Hot Sauce has all the usual holiday characters in trouble and facing a police lineup for who knows what? From Rudolph to Santa to Frosty the Snowman, these guys are under the heat and ready to give it right back!! 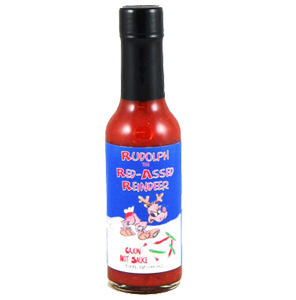 Rudolph the Red-Assed Reindeer Cajun Hot Sauce is great gag gift for Christmas! 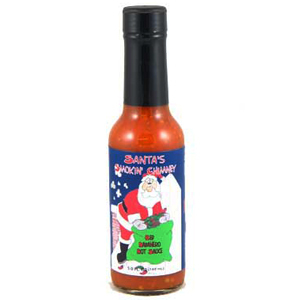 Santa's Smokin' Chimney Red Habanero Hot Sauce is great for cool Christmas gift!